I came across this interesting post by Prof. Calvin Jones, in an unusual place, ClickonWales (thanks to Pete Lipman). The idea is that large scale renewable energy projects for wave, tidal and wind power, while useful, are not a solution to climate change. “Most of the audience seemed cheered by the economic opportunity and the possibility of mitigating the effects of climate change. I was terrified. a belief that technology and increased resource efficiency can ‘solve’ our ecological and climate problems… is Walter Mitty land. It is populated by well-meaning, intelligent people to be sure, but a fantasy none the less. On ‘current trends’ we can expect three billion more people in the global middle class by 2030… To enable this, we require a mere doubling of world electricity production. Let me say this slowly. This. Will. Not. Happen. There is not enough stuff in the world for material consumption to effectively double on a global basis. There is not enough water for the dishwashers, or indeed to drink. There is not enough aluminium for the Audis, and not enough kerosene for the short-haul holidays to Hong Kong. There are certainly not enough prawns for the cocktails. This is an fine start to letting go of conventional assumptions. Real progress comes when we look towards practical ways of creating low consumption societies, with modest physical comfort but high social and cultural pleasures, and much more resilience to economic and environmental dangers. As usual, my favourite examples are from the Transition Network. 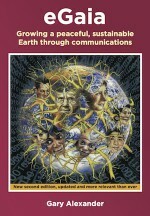 I am also working on a new edition of my book, eGaia, Growing a peaceful, sustainable Earth through communications, in which I spell out the qualities needed for a truly collaborative (but bottom up, not centrally controlled) global society, and how it might work. Thanks for pointing me to this challenging article, Gary. “Let’s be clear: increases in growth … reward not labour but the owners of capital”. >>> So perhaps *limits to growth* punish the owners of capital. All the more reason for them to denigrate the whole concept, and want to sweep it under the carpet. >>> Perhaps local societies have, but not perhaps the first, globally-driven one, which is ours. Hence the need to develop strong, locally sustainable networks. Meanwhile, as Calvin Jones’s article suggests, economists need to become accustomed to thinking the unthinkable. Yes, technology alone may not be enough. Renewables can supply maybe enough energy to allow for growth for many decades, but there may be other limits – land and water plus scare materials. We need a new view of consumption. But is that likely to be popular? Yes, I agree that we need a new view of consumption. That is the point. There are growing numbers of people who see that too, and many lifestyle changes happening. However, I can’t see it becoming ‘popular’ while the main economy staggers on. If it is going to become mainstream, I suspect that will happen on the cusp of an economic collapse, and we are beginning to see that happen. I agree with a lot of the sentiments there – except the Aluminium for Audis. I highlight this because Aluminium shares a mythological niche with Silicon, in that both are actually extremely abundant, but both are regarded as ‘modern’ and ‘high tech’ materials. Not so. What *is* true is that both require rather energy-intensive extraction and (especially) purification before they are industrially useful, at least in their elemental forms. As Oxides, they are already extraordinarily useful as building materials… For reference, O, Si and Al (in that order) are the most abundant atoms in the Earth’s crust, with Al alone (the least abundant of these three) comprising about 8%. Perceiving Aluminium as scarce is of course understandable, but is a reflection of an underlying concern (scarcity myth) about energy, not materials. The situation with water is rather different: It is also sometimes tempting to see its apparent scarcity as an energy issue (for purification, desalination, transport etc. ), rather than a quantity issue, but in fact it’s more a question of ‘location’ and ‘duration’ than anything else: We have all the water we need, and the global weather systems incorporate a vast (and free) desalination ‘machine’ which makes paltry human efforts look utterly laughable. And rain does in fact fall (abundantly!) in many places which are today considered as hot and dry, or even arid. However we are extraordinarily inept at managing how long our rainfall ‘sticks around’, what we use it for, and where the water then goes. Thanks for that very helpful clarification Simon.